Japan has the world’s third largest economy, and it could be opened up to traditional casino gambling if a group of lawmakers has its way, Reuters reported. Gambling, defined specifically, is generally not legal in the nation. The country’s economy trails only the United States and China. The United States is home to a lucrative commercial casino industry of about $37 billion annually. Macau, which is a special administrative region of China, is about equal to the U.S. output. Gambling reportedly already exists in Japan, but just not in the classic sense of Las Vegas-style casinos, which also feature other amenities like shops and restaurants. Betting currently exists in Japan on Pachinko, a popular pinball-like slot machine that awards prizes. Estimates put Japan’s casino market at $10 billion, initially. Other countries in the region (speaking broadly) are also working on beefing up their respective gambling industries. The Philippines, for example, is one the verge of brand new casinos. Singapore already has a gambling industry worth about $5.9 billion. According to Reuters, Japan lawmakers plan to introduce a proposal this fall. However, it’s chances remain unclear. Casinos have long been discussed in the country. Opponents worry about rises in gambling addiction, among other social consequences. Las Vegas Sands and Genting Group, two firms that are among the largest casino firms in the world, have reportedly expressed interest in doing business in Japan. Japan has a population of about 127.8 million, according to the latest tally. 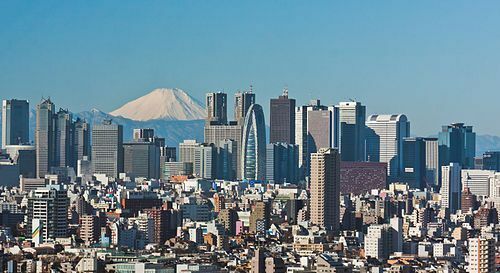 Image of Tokyo, via Wikipedia.